Durability – that’s the main forte of this SimplySleeper 47T and it has been in the TOP 10 of most durable air mattresses ever since we started the category. Everything else about it is kind of average. It promises a lot (like the maximum of 400 lbs but it doesn’t really deliver), at least not according to our tests. Although it’s rated pretty high by users on sites like Amazon (which is why we decided to review it in the first place) we didn’t find anything extraordinary in our tests. It’s not in TOP 3 in any category, it’s not the best inflatable bed the company makes and it’s not even close to the top in its price range. Harsh, we know, but that’s what our tests tell us and that’s what 3Beds.com is about – objectivity. Even when it’s not pretty. Height 8.5 " 19 "
We have to be fair and say we never expect too much comfort-wise when we review a low-rise twin blow up bed. We had a few surprises, like the camping Sound Asleep, but this one didn’t offer any pleasant surprises. It leaked air and has to be re-inflated every night. There is no flocking on you have to use a topper if you want to get a good nights sleep. Unfortunately, the top surface is slippery and doesn’t hold the sheets well, so you struggle and basically, can’t wait for the sun to come up. It tested very well in our tests, both the tensile testing of the seems, connections and the PVC itself. The ratings in the tensile testing indicate that this one’s built to last. However, we’ve seen too many reports of the internal structure giving in, so we had to adjust and leave it under the weights for longer to see what happens. We did not see any of the issues people reported (bulges, seems bursting). To be fair, we only get one product per testing period and we might’ve just been lucky. But the bottom line, durability-wise, is that ll the indicators in our in-house tests indicated that this is a durable air mattress and it’s ratings in the category reflect it. Not good – we already mentioned the issues when we discussed comfort above but it loses air. We gave it two days of test drive before we started measuring anything (most of the time inflatable mattresses take a night or two to settle and form). But, even after the two nights, we started the measuring and the scores only went down with every passing night. Again, the rating is a reflection of that. The pump is fast and seemed well made. The fact that it’s not rated as well as most of the other models is due to two factors: the noise (less important) and the fact that we noticed that it’s leaking air around the pump. You can say that this is a cheap air mattress and we are being too harsh. 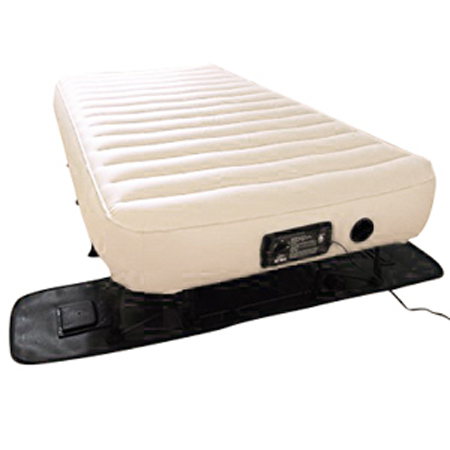 But, over the years, we tested airbeds that cost 30-40% less and performed better, so the price is no excuse. Once more, we are glad that we changed one of the rating categories for “price” to “value for money”. It’s much more useful and relevant. The SS-47T is not a bad air mattress. It’s not great either, it’s one of those airbeds that we regret ever reviewing and spending resources on. We love the company that makes it, SimplyGlobo, but we love the fact that our readers trust our ratings more. It’s an average product for an average price. User ratings – 82, ratings of our featured testers – 83 and an Overall rating of 79 / 100.